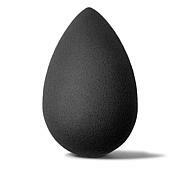 Teardrop shaped, reusable, high-definition cosmetic sponge applicator. 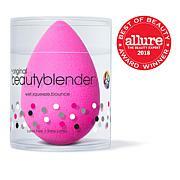 I am not sure why the other reviewer thought this beauty blender is smaller than the original. It is the same size. It does expand when wet. The color beautiful and it works great, just like the original. This sapphire beauty blender is very small. Its advertised as being like the original. But it is No where near the size of the original. Even when ran underneath water, it doesnt expand much. Very disappointing.